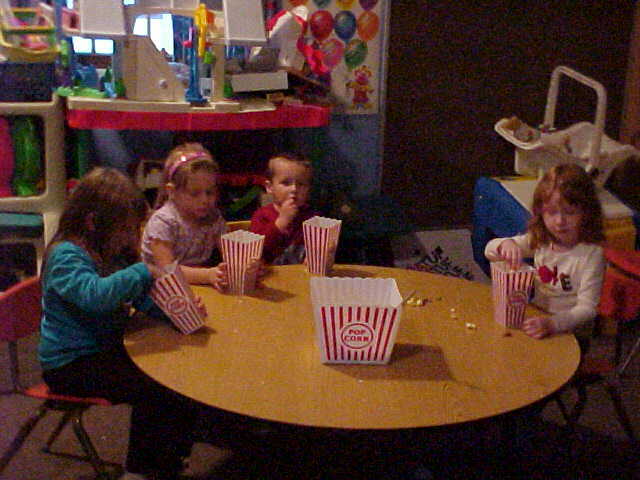 One of our favorite "Rainy Day" OR Early Out activities is Popcorn & A Movie Day! Each kid gets a turn choosing their favorite movie or sometimes during Theme Days, we'll watch a movie that goes along with the Theme of the Day. Snack is served during the movie, but with pretzels, cereal, raisins, gold fish, and more added to the popcorn.....sometimes it's hard to concentrate on the movie when there's so many hidden treasures in your snack box!